This Pear And Butterscotch Tart was created for a yuppiechef.com challenge. by Yuppiechef I had to think beyond the weather, and come up with something that would make the Duchess of Cambridge proud to serve at her table. Knowing she had chosen Le Creuset as part of her bridal registry, I decided to make something from my tatin recipe book. I have combined two of their recipes, and it is the adaption I have listed below. For the original recipes, you will have to buy a tatin dish – and if you are not so sure about whether you need one, read my review here. let the sugar turn a golden caramel colour – do not take your eyes off it! This sounds like a winner, Tandy!!! We love this entry, great work Tandy. 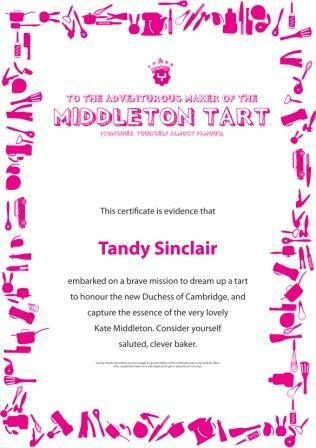 Yum, I was playing with tatin recipes a couple of months ago – this looks delish! Interesting. I like pears and caramel. What variety pear did you use? I would have thought many might be too soft and disintegrate. And you blanch them. Fair enough. 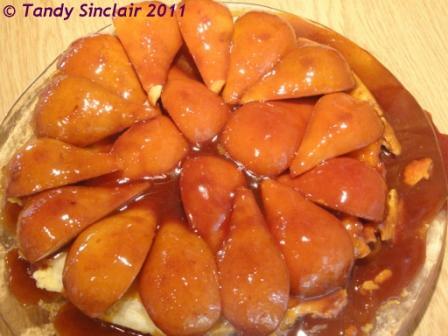 For traditional tarte tatin, I cook my apples in the caramel. I hope it is a winner!